We started off our morning with dinosaur pancakes & a strawberry volcano plus sweet dinosaur snack ideas but we didn’t stop there! I put together this fun dinosaur game to play as well. My son is a bit to young to understand how to play it yet but it also made a great coloring page. Does your little one love dinosaurs? We have even more fun dinosaur food & party ideas coming up this week. Yep, it’s a week full of dinosaurs! This game is easy to play! All you’ll need is the free printable dinosaur game and something to draw a line with. 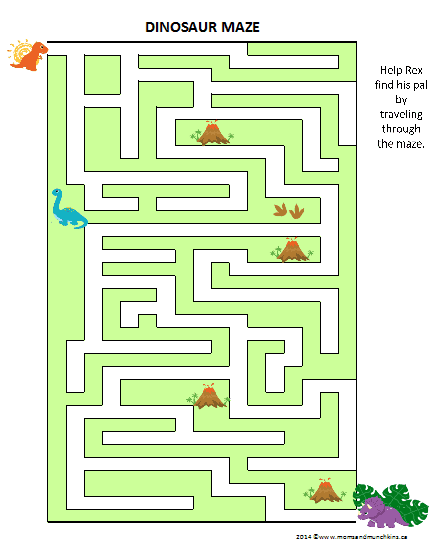 Simply start at Rex (top left corner) and try to work your way through the maze to get to his buddy in the bottom right corner. For more fun dinosaur activity, food & party ideas, visit our special Dinosaur category. Thank you to Pixel Paper Prints for the adorable dinosaur clipart. view our Family Party section for fun ideas on throwing a celebration at home with family – there’s always a reason to plan a fun party with your family! Love Disney? So do we! Check out all the fun ways to plan a little Disney fun at home with your loved ones. We’re always adding new ideas for family fun! Never miss an update by following us on Facebook, Twitter, Pinterest, Google + and Bloglovin’.